The Love Dare, the New York Times number one bestseller that has sold five million copies and was a major plot device in the popular movie Fireproof, is a 40-day challenge for husbands and wives to understand and practice unconditional love. 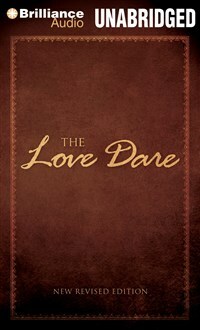 Whether your marriage is hanging by a thread or healthy and strong, The Love Dare is a journey you need to take. It’s time to learn the keys to finding true intimacy and developing a dynamic marriage. ADAM VERNER is a voice over artist and actor. He has worked extensively on stage and screen and narrated a diverse array of audiobooks, from fiction and fantasy to nonfiction self-help and history. He’s been involved in the world of audiobooks since 1980 when his father recorded Golden Books for him to listen to. Adam holds his MFA in acting from the Chicago College of Performing Arts at Roosevelt University and his commercial voice over clients include Gillette, Kmart, McDonalds, Harley Davidson, Wrigley, Keystone Beer, and many others. If he could be any animal in the world it would definitely be an orangutan.